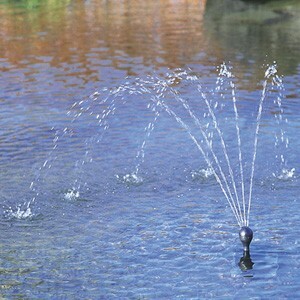 OASE Aquarius Fountain Pump Sets for ponds or water features. Attractive water fountain displays. 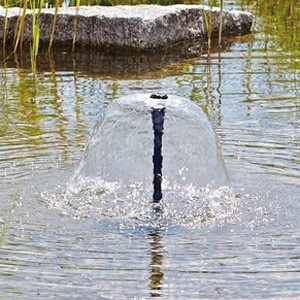 OASE Aquarius Fountain Pump Sets combine innovative high-end water pumps, telescopic risers and fountain nozzles, providing everything required to produce an attractive pond fountain display or for use in an underground reservoir to create a pondless fountain. 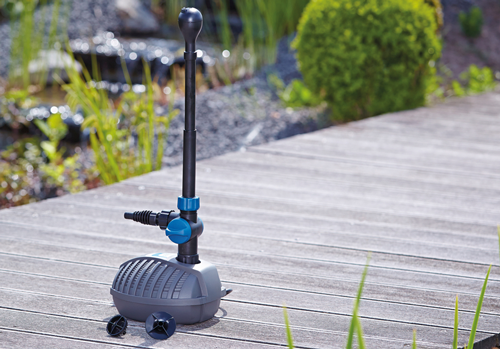 The Aquarius pump models 750 to 3500 are supplied with 3 different decorative nozzle patterns and are perfect for smaller ponds and water features. 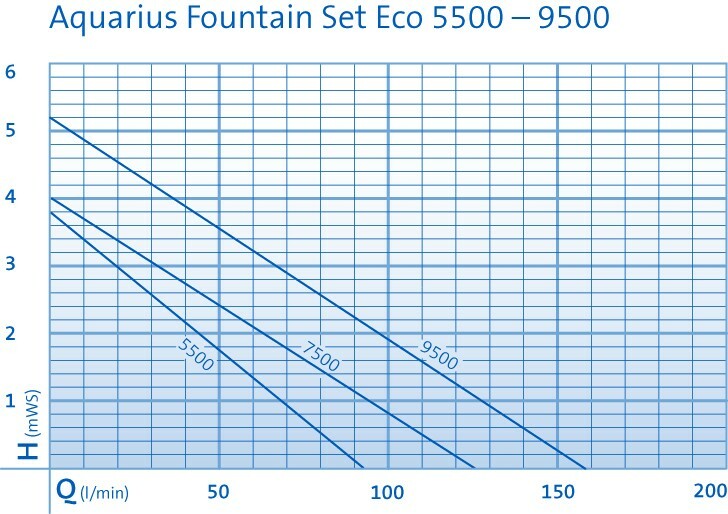 Aquarius Fountain Set Eco models 5500 to 9500 feature a single multi-tiered Vulkan nozzle for producing a larger water display. The Aquarius Fountain Pump Sets come in a range of sizes. The smallest being the 750, which can create a fountain with the maximum height of 0.7m. 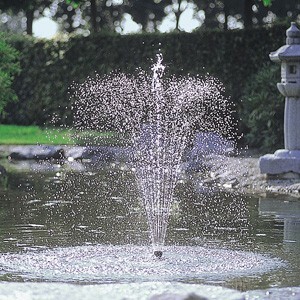 The largest of the range is the 9500; which can creach a maximum fountain height of 3.35m. Decorative fountains are a wonderful addition to an ornamental or fish pond as these add visual appeal but also help to circulate the pond water and add vital oxygen which is beneficial to both fish and plant life. 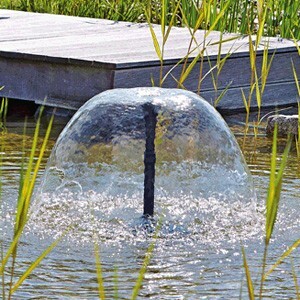 The OASE Aquarius Fountain Pumps are simple to install directly into the pond with the pump being fully submerged. The telescopic riser will allow the top-mounted fountain nozzle to protrude out of the water to create the display whilst ensuring the pump remains fully underwater. 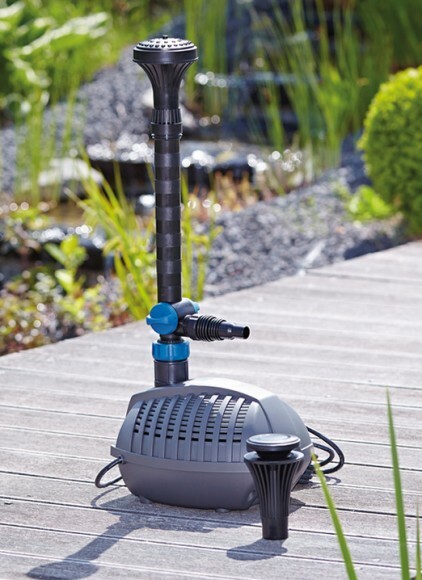 All Aquarius fountain pumps are supplied with 10 metres of 230v single phase electrical cable for connection to an outdoor switch box or weatherproof garden socket. 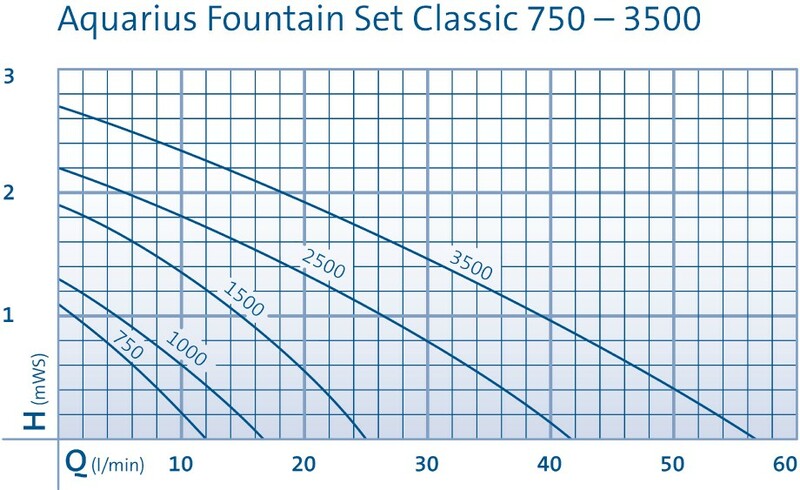 For smaller ponds, the cost-effective Aquarius Fountain Set Classic 750-3500 pump sets are ideal and all sets come complete with pump, telescopic riser and 3 decorative nozzles to create different water jet displays. 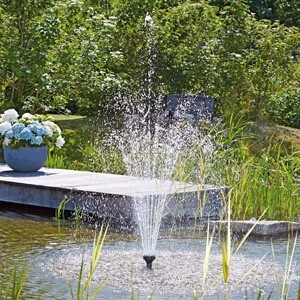 For larger ponds and pondless features, the Aquarius Fountain Set 5500-9500 are well suited as these create thicker water jets and larger display heights. The 5500-9500 models include 2 decorative nozzles (Lava Water Bell Nozzle and Vulkan Multi-Tiered Nozzle). For impressive displays in large ponds, public and private water features and lakes, the Aquarius Eco Expert Pumps can be coupled to a range of optional fountain nozzles and the 22000-44000 models offer significant flow rates from 22,000 Litres/Hour up to 44,000 Litres/Hour. The Aquarius Eco Expert can also be coupled to the OASE FM Master EGC Smart Controller to allow ‘dancing’ functionality and smartphone or tablet control from anywhere in the world.